Jiffy Bags are an industry leader in protective packaging for posted items, due to their tough, tear-resistant materials. 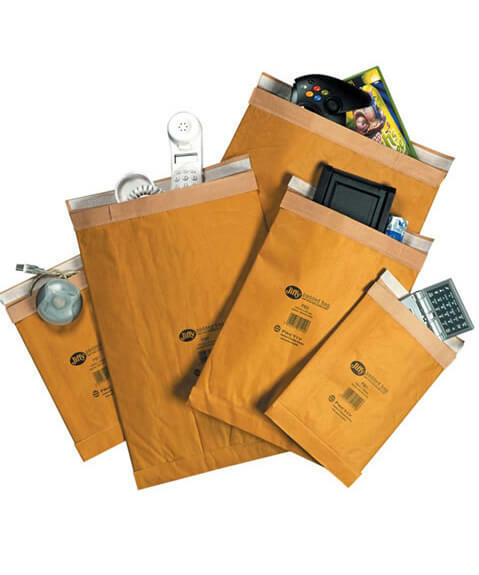 Jiffy Bags are available in white (bubble lined Airkraft bags) and gold (Padded bags with a fibrous filling). All Jiffy bags are kept in stock now and at great prices. The Airkraft bags have a bubble liner and are perfect for lighter parcels, as they offer good protection but are still light for posting so they won’t make your postage excessive. The padded bags have a paper outer and fibrous filling, which bulks when used and provides a good layer of protection for more delicate items. We have a good range of sizes available, as well as pack sizes from 50 to 200 so that you can buy Jiffy Bags in bulk in the quantities you need. Watch our video about "Jiffy Bags" for more information about this packaging option. Use the full screen option to see it in the best quality and you can also view the transcript by clicking on the link below the video. 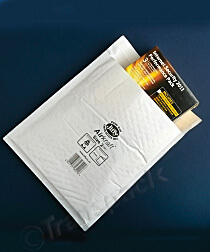 At Transpack we stock a range of protective postal bags, each with a slightly different function. This is a white Jiffy Aircraft Bag. It is lined with laminated bubble which provides extra strength and protection against shock. It is lightweight and made by Jiffy, the recognised Industry leader for quality and consistency. They are tear and puncture resistant and suitable for sending a range of items which need protection. There is a self-seal strip on the flap for easy sealing. This is an original Jiffy padded bag and is by far the toughest postal bag. They are actually proven to get thicker the more they are used. They are made from paper with a fibrous filling and also have a flap and self-seal strip. We also stock bubble bags made from Jiffy bubble wrap, also complete with a self-seal strip. These come in either standard bubble wrap or anti-static pink bubble wrap which is very popular with our customers in the electronics industry. Order online or by telephone before 3pm and we aim to despatch your order the same working day. Orders over the value of £35 are delivered free of charge. For any other questions call our customers service helpline on 02380869999 or visit our website and our friendly staff will be more than happy to help you.